The Baltimore Tree Trust is a 501(c)3 incorporated in the State of Maryland. All gifts are tax deductible to the fullest extent allowed by law. As a nonprofit organization, The Baltimore Tree Trust receives funds from the state, city, foundations, corporations and private individuals. Your gift supports critical initiatives that improve the health of our city. Each year, Baltimore Tree Trust plants hundreds of trees that cool our streets, clean our air, and instill a stronger sense of community. All of our dedicated financial supporters will be recognized in the Baltimore Tree Trust’s annual report. Thank you for helping the Baltimore Tree Trust make our city a more healthy and beautiful place to live. We appreciate your support and partnership! You may donate online at our PayPal account. 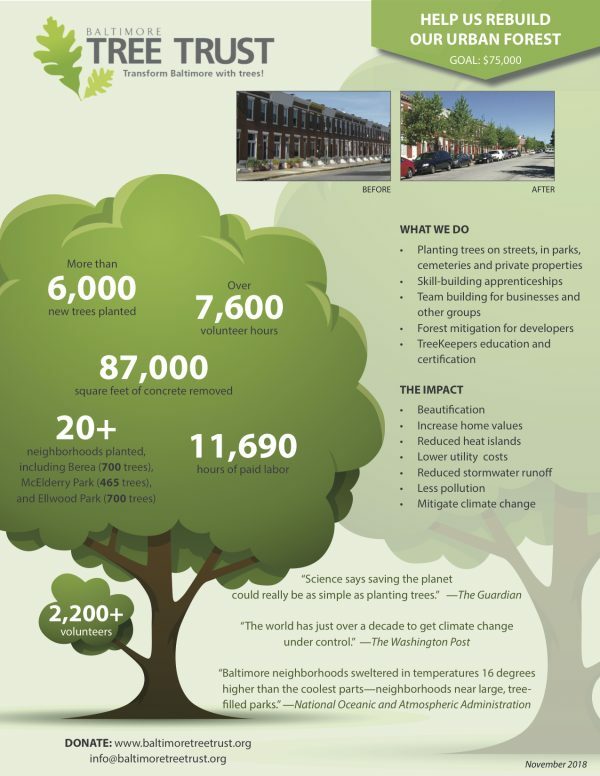 $5,000 helps towards greening up an entire city block with new trees. $1,000 creates a new tree pit in the concrete and plants a tree. $500 covers watering, mulching, and weeding for 10 street trees for one year. $250 removes concrete to create a new tree pit. Any amount helps us to plant trees, educate our community about trees, and care for our trees.